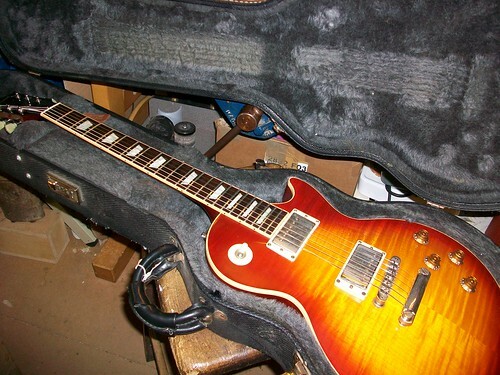 This Gibson Les Paul is in the workshop because of a headstock break. 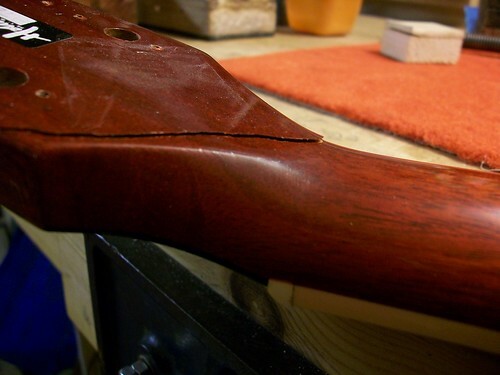 It fell over in its case and when the guitar arrived at a gig the disaster was discovered. 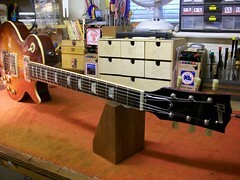 The owner was not too interested in the guitar being invisibly repaired. He just needed it back quick for gigs at the weekend! Arrived at the workshop on the Wednesday. A quick turn-around repair, designed to meet the highest standards. Hi Graham, I have a similar break with my Gibson EC-10 acoustic. I live in Deptford, so I am quite close to you. 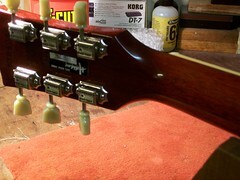 The headstock is not quite completely broken off. I am looking for a seamless repair (the neck is black with no grain showing). Also there are a few scratches I would like you to look at too, if you can. The instrument broke on my back after a fall down a flight of stairs. I feel I owe it to her to get a good repair as it is quite probable she saved me from a broken back (as well as years of playing). Please let me know when would be a good time to pop down and show you what the situation is. Many thanks for you time in this. Sorry to hear about your guitar issues. 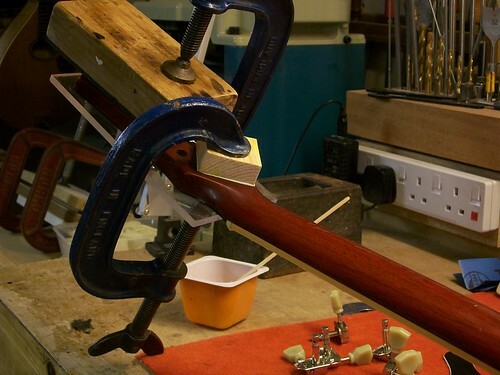 Could you email me at grahamparkerluthier@yahoo.co.uk. We can then set up an appointment to make an assessment of the guitar.